* Value-added modelling is a common approach to use to try to infer the "quality" or "value" of inputs. * In education, these methods have become quite popular politically and academically. * But in a sense using these methods in education is an abstraction. * Let us first in order to grasp how value added methods were first developed think of a production example. * Imagine that you are manufacturing tablet computers (iPad). * On each step of the production process there is a different "value" that is added to the process as a result the particular inputs. * In order to conceptualize this think of the product at each stage being worth a certain value that is then bought buy the next person in the manufacturing chain. * However, you do not want to use the market to assemble the tablet computers. * You want to assemble them in house. * Therefore you want to figure out a way of inferring how much value each input has. * To do this, imagine that run a series of non-market valuations after each stage of the production process to infer a current price. * Then you take the change in that market price as a measure of the value of those inputs. label var comp_id "Company ID"
* Each of the companies has a different assembly line structure. * Let's imagine that at each stage that company's structure ads a constant amount of value to all products. label var comp_fe "The fixed effect (specific to that company) added to each product each stage"
label var prod_id "Product ID"
* Each product line has some inherent design component that makes it more or less valued at each progressive stage than other products. label var prod_fe "Product Fixed Effect"
* You have different stages with the initial stage product idea. label var prod_stage "Production stage"
* Now imagine also that there are 100 contractors in tablet computer production market. * These contractors get random contracts as to which product to work on. * This is what we really want to know. * How good are these contractors at "adding value" to the product. * This is the trickiest part of the code so far. * First we need to generate the contractors. * There are several ways of doing this. * I will use the many:1 merge command to accomplish this task. * Imagine that our 100 contractors are subsidiaries of 5 different umbrella companies. label var cont_company_id "Contracting company ID"
label var cont_company_fe "Contracting company effectiveness"
* Each of the contracting companies has 20 contractors they manage. label var cont_id "Contractor ID"
label var cont_fe "Contractor effectiveness"
merge m:1 cont_id using "contractor.dta"
* Let us think that whenever a different product is developed there is some unobserved component that adds or subtracts random value from a product line independent of all other inputs at each stage. label var rand_effect "Random idiosyncratic production effect unique to each product at each stage"
* Finally, imagine that at each stage there is an "average" amount of value added at that stage. label var stage_fe "Production stage fixed effect"
merge m:1 prod_stage using "Stage.dta"
* Let us first add on a production stage zero representing the initial "value" of the product idea. * This is a little tricky to do. * I will expand the data for production stage 1 and indicate the created data with expand indicator. * Now I want to make sure that stage 0 production is not done by any contractors so there is only the company effect and product effect. * Now let us start to generate the values of the products at each stage. * To begin with we will generate the initial value of y. * First let us double check to make sure our data is sorted properly. 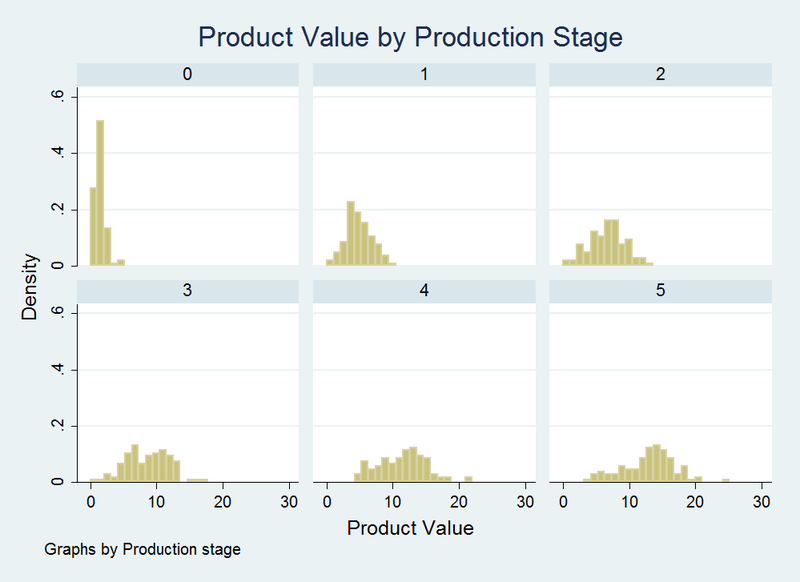 * This is the retention value of a product from each previous stage. * If lambda is low then it means that once the product is processed it cannot be used in the previous production stage. * If lambda is high then it means that the previous value is retained plus any value added of progressive stages. * Now let us generate the cumulative value added data. * We can see that on average at each production stage there is an increasing value of the product. * However, we can also see that the variance in values increases as the value increases. * This is because of the cumulative variance effect of the various components combined with the high retention value of each previous stage (lambda). * Now that we have data generated through a Value-added simulation we can start testing different value added estimators. * That will be for a later post!